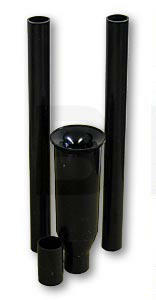 Bell Fountain kit includes two 7" extension tubes, one coupler and a 6" x 1/2" adjustable fountain head. Works best for Pondmaster pumps 250-700 gph. 1/2" male outlet.